(Nanowerk Spotlight) Carbon nanotubes (CNTs) have captured the imagination of many scientists and engineers as a result of properties of individual tubes (e.g. very high electrical and thermal conductivities, high stiffness). Things often get ‘messy’ however, when one tries to make them work collectively, e.g. in composites. Three-dimensional networks of carbon nanotubes are usually made within a supporting material, such as in polymer composite or liquid dispersion. While networks of CNTs have been observed transiently in furnaces with lots of raw nanotube material, such an approach does not permit much experimental control over the resulting network. A novel approach to fabricating CNT networks are CNT aerogels. Aerogels are novel materials in their own right - a material derived from gel in which the liquid component of the gel has been replaced with gas. The result is an extremely low density solid. Microscopically, aerogels are composed of tenuous networks of clustered nanoparticles. These materials often have unique properties due to their very high strength-to-weight and surface-area-to-volume ratios. To date, most aerogels are fabricated from silica or pyrolized organic polymers. Fabricating aerogels with CNTs offers potential for improvement over current carbon aerogel technologies in device applications such as sensors, actuators, electrodes, and thermoelectrics. Researchers at the University of Pennsylvania have created CNT aerogels that supported thousands of times their own weight after polyvinyl alcohol (PVA)-reinforcement, and, depending on processing conditions, their electrical conductivity ranged as high as ca. 1 S cm–1. Of interest to the research community could be that the CNT aerogels offer a medium from which to gain broad insight about optimal CNT networks and to control CNT network properties. "Our work was motivated by the fact that any nanotube network formed within a supporting material is strongly influenced by the presence of this material" Dr. Arjun G. Yodh explains to Nanowerk. "The supporting material, for example, influences how well the nanotubes can be dispersed, and even the transport properties of the nanotubes." Yodh, the James M. Skinner Professor of Science in the Department of Physics and Astronomy at the University of Pennsylvania, and his collaborators derived their aerogels directly from CNT networks in suspension, in effect fabricating a free-standing, three-dimensional networks of carbon nanotubes in air. "We started with CNT gel networks in suspension, removed the suspending fluid (i.e. by freeze-drying and critical point drying), and thereby produced a network of CNTs with controllable purity, connectivity, strength, conductivity and shape" says Yodh. The flexibility afforded by this process enabled the researchers to control CNT concentration to utilize optimized CNT dispersion processes for network reinforcement with, for example, polyvinyl alcohol, and to infiltrate or backfill them with polymeric fluids. Like other aerogels, the nanotube aerogels have a very large strength-to-weight ratio, and they have a number of potential applications via tube interactions with the environment and electrical transport. The changes in the electrical transport properties of the CNT aerogels in various environments make them appealing for use as chemical or biological sensors. However, the electrical conductivity of the aerogels was found to depend on several factors, including nanotube and PVA content, and the drying process (i.e., freeze-drying or CPD). The freeze-dried samples were consistently less conductive than the critical-point-dried samples. "We attribute this difference to disruptions of the nanotube network that occur during the freezing process" says Mateusz Bryning, a PhD student working on the project. "Samples created by CPD suffered significantly less mechanical distortion and had more reproducible conductivities." Bryning is first author of a recent paper, titled "Carbon Nanotube Aerogels", that has been published in the February 1, 2007 online edition of Advance Materials. The large surface areas of the CNT aerogels make them appealing for use as electrodes in some types of batteries and electrolytic capacitors. Also, as Yodh points out, because the CNT aerogels can be backfilled with a polymer or other material, the aerogels can provide the basis for composite materials utilizing a variety of materials. "Our initial results with epoxy indicated that, upon backfilling and curing, the conductivity remained constant to within a factor of two" he says. "Since the nanotube network was formed independently of the host material, the process should be useful for making composites that might not be otherwise feasible, for example based on ceramic slurries or even metals." 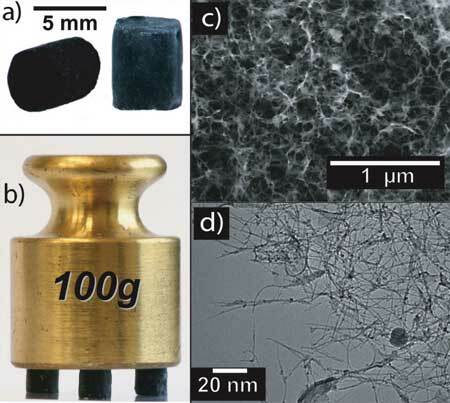 Furthermore, since the nanotube network is made a priori, CNT composites can be made without developing unique processes for dispersing the nanotubes in each type of host material. Yodh says that attaining many of these goals will require through characterization of aerogel properties, and this research is still at an early stage. In particular, an economic challenge is the expense of the process, especially for applications that require large quantities of aerogels, as is the case with composites.